I've been wanting to get a camera tripod since before our Alaska trip (since May), but I was having a hard time finding one that would work for a medium size camera with a larger lens (350mm) that was packable. I originally ordered a Slik Pro 550DX, but as soon as I got it decided to send it back since it wasn't decent to carry around while trekking in Alaska. It was built like a truck, but weighed as much as one too. So I wasn't able to get a tripod before our trip. No biggie, but would have been nice. This is when I started researching a lot more and decided I really wanted a carbon fiber tripod, and preferably a Gitzo, as the reviews are all top rated. I soon learned that a Gitzo carbon fiber was well out of my price range, even used, so the search continued. I almost ended up buying a Benro, but at the last minute read a blog about someone who had ordered one and how it looked good at first turned out to be a piece of junk later. You wonder how a Chinese knockoff company (Benro) can produce these products for 1/3-1/4 of the price and you find out because they only concern themself with the outer visual appearance while the rest of the units are complete junk. So scratch the Benro junk, I'll keep looking. 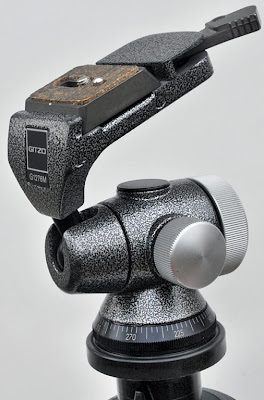 I finally came back to Gitzo, but decided I'd just get a Basalt legged tripod instead of the carbon fiber, so off to ebay I went. While doing a search for Gitzo, I came across the last posting (listed by time left) on ebay. It was a Gitzo tripod with Gitzo head, a case, 2 extra quick releases and a cloth shelf. PERFECT and exactly what I was looking for! I quickly did a search on weather the tripod and head would hold my camera's weight and if it was tall enough and that was a yes for both. Awesome, so I hit the buy it now. Got the tripod a few days later and it looked great! I looked up the model numbers again, Gitzo G1227 MK2, Gitzo G1276M Head, Kakuba tripod case, and two quick release plates.... I got a really good deal. So the GREAT part of all of this is that the Gitzo G1227 MK2 turns out to be a CARBON FIBER tripod! Funny what prayer will do even though this was a minor thing in the grand scheme of it all.